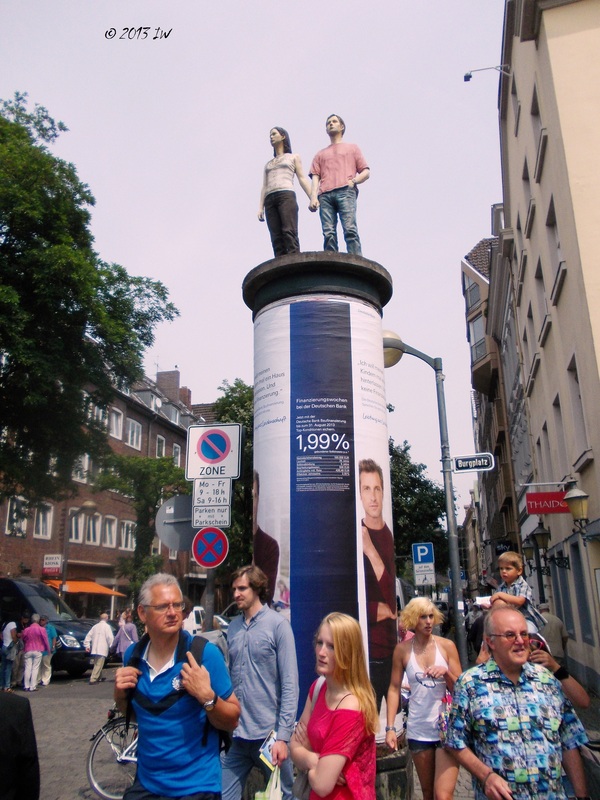 Düsseldorf is the newest discovery of 'must see' towns I visited lately. I know that my impressions about a city can be largely influenced by the weather and this time I had an amazing good weather on my side. Plus a big parade of hunters that lasted for hours and a big fair on the occasion of France's National Day (14 Juillet). But all those subjective considerations put apart, the city has everything you may need to visit: modern art exhibitions, especially on the streets where you can often find pieces of art in the middle of the most usual venues, pleasure trips on Rhine, a huge adventure part - that I did not visit, but heard the screams of those enjoying it - fine restaurants and shopping attractions. Compared to Berlin and many other cities from the Eastern part that I visited recently, it has a coherent architecture - a lot of Art Nouveau samples that I loved- and a better life standard reflected in the quality of customer service, hotels and restaurants. I might be superficial to compare it to Cologne - especially due to the historical competition when it comes to the Carnival, but also economically and socially. But somehow, I had the same good feeling as after visiting Cologne and the areas around years ago. Translation: if I will ever have on my mind a plan to move somewhere else in Germany, this city is on the top list of choices. After arriving relatively fast at my hotel and discovering that I made a so-and-so decision, we run as fast as possible to the center for seeing as much as possible from the city. We did not run the marathon till the center, but were helped by the very efficient public transportation. Even if a Sunday, the trams and S-Bahns were arriving almost every 15 minutes and were plenty of tourists from all over the world, but especially from Japan and France. No wonder, as both countries have their own cultural institute in town. With the S-Bahn one can also go outside the city, such as Duisburg. 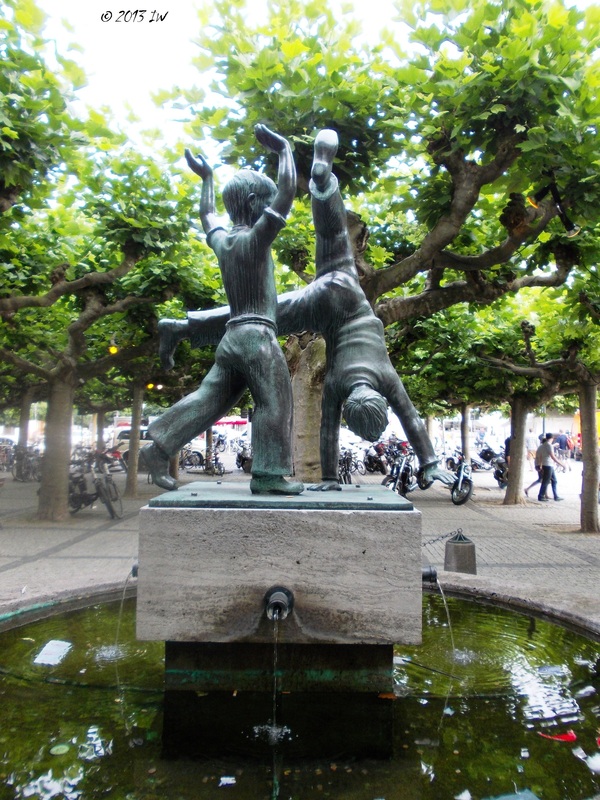 Plus, due to the good connections to Dortmund, Bielefeld and Essen within one hour of travel by train, I may consider to return to see more cities in a fast and efficient way, while continuing to discover Düsseldorf. With so much planning in my mind for the next trips, we reached the station Heinrich Heine, our final stop for this part of the day. Heine was born here and his first residence is nowadays the Heinrich Heine bookstore, hosting various literary events. The bookstore was closed this time. If you plan to visit the city this summer, expect a lot of events on Sundays, on the occasion of the celebration of 725 years since the creation of the city. Most of them are parades, as the one we stumbled upon: hunters of all ages and genders dressed in green uniforms and holding abundance horns full of flowers. Some of them were horseback riding, some were playing instruments. As I am not a fan of hunting and do not like huge gathering either, I preferred to go finding small streets around to see how the city really looks like. According to the newspapers, more than one million people attended the ceremonies, most of them locals. The main attraction of a summer afternoon, in case that your children do not cry for spending some time at the Adventure Park - no, thank you, I've been to Disneyland once and it's enough for this life - or you have a date of one of the many restaurants and bars - all styles and budgets are welcomed - is to go on the grass and look at the Rhein. You can take a beer or a pick nick basket and some books too. It is free and quite relaxing. 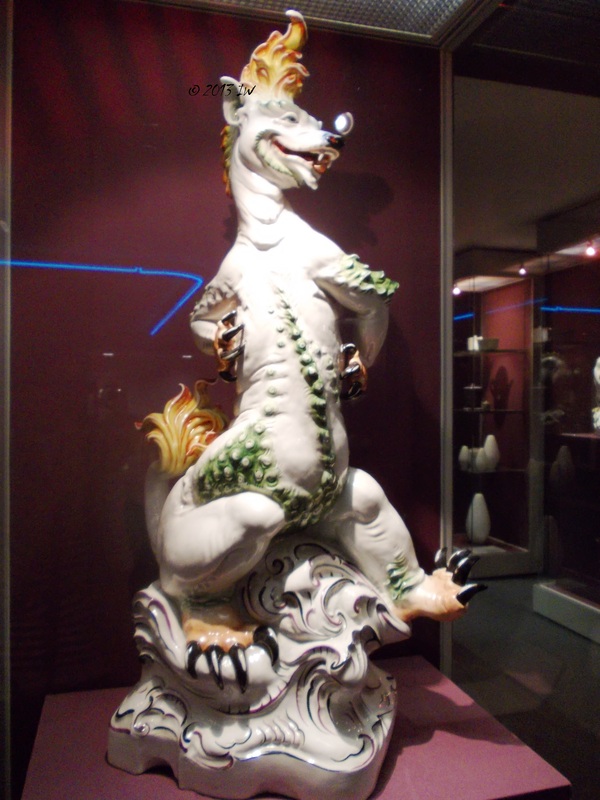 For dedicated museum visitors, there are plenty of opportunities, from modern art galleries and the museum of contemporary art, to some less challenging options, such as the Film Museum or the Hetjens Museum where I discovered a little piece of the world history written on pieces of ceramics. Another artistic stop was the Kunst im Tunnel, where I admired some samples of Brazilian modern art, unfortunately without too much explanations or guidance (the catalogue was in the printing process, I was told). Compared to Berlin, where one can find from time to time some museums open on Mondays too, for tourist purposes, in Düsseldorf everything is sealed that day so I missed to see more local art. I tried to compensate with some lessons and local architecture. Art nouveau is well represented, an outstanding sample is Carsch Haus, but also anonymous houses that you can spot in the residential areas. 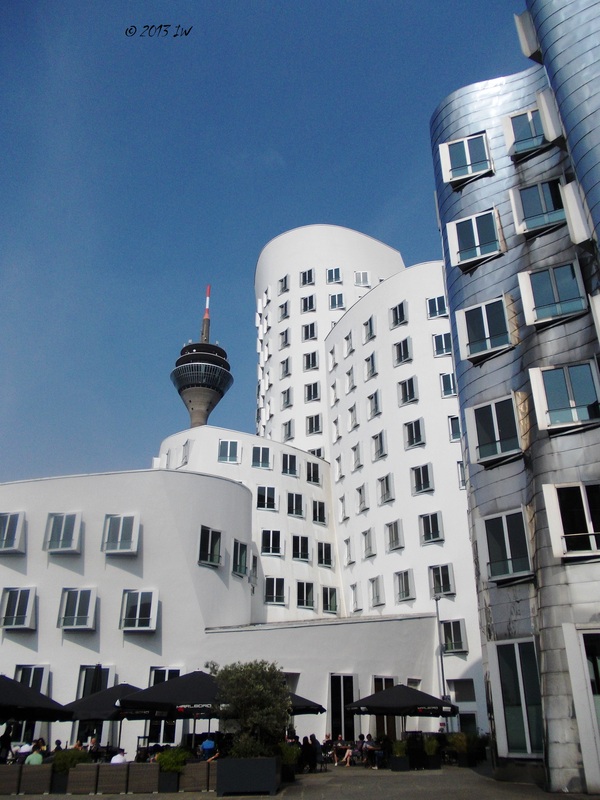 The most wanted location for modern minds and photographers is the Medienhafen, with a Frank O. Gehry signed construction. After more photos and a short documentation visit at the Hyatt nearby, we went back in the historical area. Before that, we tried to walk on one of the bridges, but after 10 minutes of hardly moving between joggers, bikers, families with children and huge stuffed animals brought from the adventure parks and teenagers, we decided that we rather need to be lazy tourists and have a coffee somewhere. This somewhere was very close to the Königsallee - or 'Kö' for the shopping friends - the place where people spend a lot of money in exchange of small cute things. The good news was that everything was closed and we only had a window shopping tour. In one area, you were walking on the pavement with the name of the famous personalities born in town - Heine included - and thus, we learned more than what to write on the next luxury shopping list. As usual, wherever you are, be careful how you use your eyes. When looked up in the clear sky of the summer day, we spotted more samples of Art Nouveau and interesting sculptures. After a rather relaxing day of travel, we started the next day decided to get more local colours and we headed to the market. Maybe it was too early or not the right day for the market, but with the exception of the beautiful flowers and some corners with spices and teas, we did not find anything interesting enough for the foodie lovers. The trip to the food court of the local Karstadt brought more information about French cheeses, while the visit at the bakery revealed my ignorance about the impressive sorts of German breads. A local frozen yoghurt diminished the tension and we tried to use the hours left visiting the Information Center - the main point for historical tours organized regularly, in German and English - and wandering in the residential area or simply admiring the boats coming and going on the Rhine. We did not travel by airplane - the local airport is busy connecting not only different German cities, but also Germany to the rest of the world, Asia and US among others - but by fast train so going to the train station was extremely easy with the S-Bahn. In the area around there are many oriental shops and an impressive amount of Moroccan bakeries. Apparently, I have a lot to learn about the city and definitely I should return soon.